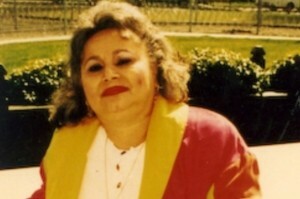 Griselda Blanco’s story was often told in numbers – she turned tricks at 14, and moved 300 kilos of cocaine a month in her 40′s. Known as the “Godmother” of the cocaine racket, she had up to 20 aliases, and unsubstantiated lore said she ordered some 250 murders. Police put it closer to 40. She died Monday at 69 at the Cardiso butcher shop on 29th Street in a Medellin neighborhood, where the former madrina was gunned down after a life of drugs and murder. Her last act on earth was buying $150 worth of meat. The cocaine trade pioneer, who made her mark by bloodying Miami’s streets, died the same way she was arrested in 1985 – with a Bible on her chest. It was a predictable end to a life marred by violence, prison, and impunity — a legacy nearly forgotten until filmmakers made her notorious. At least three feature films and an HBO series featuring Blanco were in the works at the time of her death. An elderly woman who was known as Colombia’s “Queen of Cocaine” was gunned down in the northwestern city of Medellin, police said Tuesday. Griselda Blanco (69) was killed by two bullets at close range – a violent end not unlike the ones that authorities say she ordered during her prime in the 1970′s and 1980′s. Witnesses heard the roar of a motorcycle and two gunshots Monday afternoon, Medellin police spokesman Diego Chavarria said. By the time authorities arrived at the scene in Belen, a residential neighborhood in Medellin, they found Blanco lying on the ground in a pool of blood. Blanco, also known as “the godmother” and “mafia’s mother,” gained notoriety in the 1970′s and ’80s when, authorities say, she was responsible for shipping multi-ton shipments of cocaine from Colombia to Miami. She was also the mastermind, investigators say, of countless murders. She was also linked to drug lord Pablo Escobar. In 1975, Blanco was charged in Miami with conspiring to manufacture, smuggle and distribute cocaine in the United States. For the next decade, she lived in Colombia, using false names and documents to hide from authorities. The Drug Enforcement Administration arrested Blanco in Irvine, California, in 1985. She was convicted and sentenced to six years in prison. But prosecutors were not done with her. Blanco was charged in 1994 with ordering three murders in the Miami area. The killings – including that of 3-year-old Johnny Castro, who was shot while riding in a car with his targeted father – happened in 1982. In 2004, she was deported to her native country and maintained a low profile in her hometown of Medellin. According to Columbian press reports, she was walking out of a butcher’s shop yesterday when two gunmen on motorbikes pulled up before one pumped two bullets into her head. For a woman who had been credited with inventing the notion of a “motorcycle assassin”, the manner of her death came as no surprise to many, it was reported in The Miami Herald. Nelson Andreu, a former Miami homicide detective who had investigated her, said: “It’s surprising to all of us that she had not been killed sooner because she made a lot of enemies. Brought up in the slums of Medellin, Blanco went from a simple pickpocket to command an empire that shipped an estimated 3.400lbs of cocaine a month. She also symbolised the blood-soaked era of the 1970′s and 80′s when gangs would ambush their rivals in public, leading to her cartel being dubbed the “Cocaine Cowboys”. She ran the empire with three of her sons, two of whom were later assassinated in Columbia, while three of her husbands have also been killed in drug-related violence. Known for her flamboyant lifestyle, she named one of her sons Michael Corleone in tribute to The Godfather movies. Blanco’s exploits were also popularised in the 2006 documentary Cocaine Cowboys, which explored the rise of the drug in Miami during the 1970′s and 80′s which inspired the films Scarface and Miami Vice. Interviewees argue that Blanco played a major role in the history of the drug trade in the city and other areas across America. This entry was posted on Wednesday, September 5th, 2012 at 10:02 am	and is filed under Criminal. You can follow any responses to this entry through the RSS 2.0 feed. You can skip to the end and leave a response. Pinging is currently not allowed. Hi, I believe your web site could possibly be having internet browser compatibility problems. Whenever I look at your web site in Safari, it looks fine however, if opening in I.E., it’s got some overlapping issues. I merely wanted to provide you with a quick heads up! Aside from that, excellent site!